Pepsi India is back with a new campaign for 2013, targeted at youth (of course) and centred on their need for immediate gratification. This is a direct extension of what Airtel did a couple of years back, with their Impatient Ones campaign for broadband. The new tagline ‘Oh Yes, Abhi’, on the lines of ‘Carpe Diem’, is a good phrase that should catch on. The TV commercial though, didn’t strike a chord with me. The music is lacklustre and the storyboard is unconvincing. Pepsi’s web presence though, is more effective. The microsite is essentially a slick, simple, social one-pager laid out in a tiled format (Do we see a Windows Phone inspiration there?!). 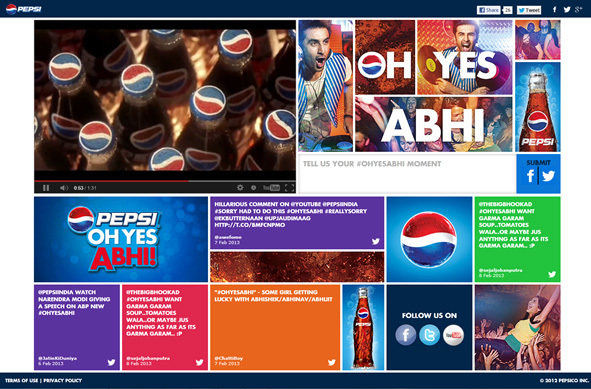 The page hosts the TV ad video and the tiles stream live updates from Twitter that pull tweets featuring the #ohyesabhi hashtag that Pepsi is promoting. Visitors also have the option to post to Facebook or Twitter directly from the page. Pepsi India’s popular brand page on Facebook, with more than 3.5million likes, feature posts that stick to the theme via one liners and campaign imagery. I think we will see more of this campaign through summer, considering Pepsi debuts as the title sponsor for IPL this year. I am hoping they come out with more interesting and original ideas through the year.